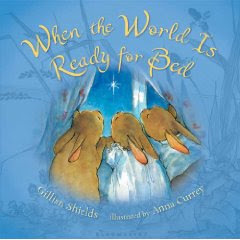 When the World Is Ready for Bed by Gillian Shields was on the "new books" rack in the children's section of our library last weekend, so I picked it up. I had seen it reviewed at Kids Lit recently, so I was excited to spot it on the shelf. I've been reading it to my 2 year old daughter, and she just loves it. It's a picture book that follows a family of rabbits as they get ready for bed. They pick up their toys, and brush their teeth, and read books, and do all the other things most kids do before snuggling into their beds at night. I love the simplicity and the gentle flow of the words. It's an easy and enjoyable book to read. And the watercolor illustrations by Anna Currey are warm and comforting, blending well with the calm feeling the words evoke. I highly recommend this as a book to read aloud to preschoolers at bedtime. The first time I read it to M, I ended up reading it three times because she kept wanting me to read it again! This review was written based on a copy of When the World Is Ready for Bed that I borrowed from the library.